No one knows compliance better. We’re the leading experts, and now we’re sharing our knowledge by translating a complex and evolving picture into actionable insights for every state. CardX is available and additional terms apply. Click the state to learn more. CardX is not yet available. Check back soon. Following the March 2015 decision in Italian Colors Restaurant v. Harris, merchants can now use CardX in California. Yes, California businesses can use CardX. Yes, California government institutions can use CardX. Yes, California education institutions can use CardX. No, Colorado businesses cannot currently use CardX. New states continue to open to us, so check back soon. Yes, Colorado government institutions can use CardX. No, Connecticut businesses cannot currently use CardX. New states continue to open to us, so check back soon. Yes, Connecticut government institutions can use CardX. No, Connecticut education institutions cannot currently use CardX. New states continue to open to us, so check back soon. Following the November 2015 decision in Dana’s Railroad Supply v. Bondi, merchants can now use CardX in Florida. Yes, Florida businesses can use CardX. Yes, Florida government institutions can use CardX. Yes, Florida education institutions can use CardX. No, Kansas businesses cannot currently use CardX. New states continue to open to us, so check back soon. Yes, Kansas government institutions can use CardX. Yes, Maine businesses can use CardX, so long as they disclose the Credit Card Price in dollars and cents whenever they post or quote their prices. See how to make the additional disclosure. Yes, Maine government institutions can use CardX. Yes, state schools in Maine can use CardX. No, Massachusetts businesses cannot currently use CardX. New states continue to open to us, so check back soon. Yes, Massachusetts government institutions can use CardX. Yes, Massachusetts education institutions can use CardX. CardX is available. Minnesota requires that the customer be informed of the credit card fee with signage at the store entrance (if applicable) and orally at the time of sale. Yes, Minnesota businesses can use CardX. Yes, Minnesota government institutions can use CardX. Yes, Minnesota education institutions can use CardX. Yes, New York government institutions can use CardX. No, Oklahoma businesses cannot currently use CardX. New states continue to open to us, so check back soon. Yes, Oklahoma government institutions can use CardX. Yes, Oklahoma education institutions can use CardX. Following the August 2018 decision in Rowell v. Paxton, merchants can now use CardX in Texas. Yes, Texas businesses can use CardX. Yes, Texas government institutions can use CardX. Yes, Texas education institutions can use CardX. CardX does not provide legal advice. These materials are for information purposes only and not for the purpose of providing legal advice. Please review your circumstances, including applicable state law, with your independent legal adivisors. To pass on the credit card fee, merchants have to comply with the contractual rules required by the card brands (such as Visa and MasterCard) as a condition of accepting their cards. CardX is a turnkey solution and automatically has you covered. The merchant must be registered with the card brands. Our team completes each registration on your behalf. The merchant must inform their customers of the credit card fee with appropriate signage at the store entrance (if applicable) and at the point of sale. Our team provides you with all necessary signage, keeping customers informed—and keeping you compliant. The amount of the credit card fee must not exceed 4%, and the merchant must not profit from the credit card fee. Our solution passes on a 3.5% credit card fee. You receive 100% of your sale—no more or less. The credit card fee and the price of the product or service must be processed together as one transaction. Our solution processes the credit card fee and the purchase amount as one transaction. The receipt must show the amount of the credit card fee as a separate line item. 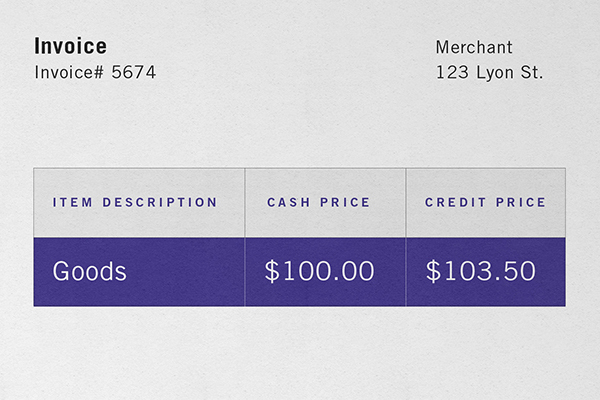 Our solution produces a receipt that itemizes the credit card fee. The merchant must not apply a fee to debit cards. Our solution automatically detects when a debit card is entered and applies no fee. Q: I see that some companies offer a “cash discount” program. Is this compliant? A: In general, no, because they list the cash price and add a fee at the point of sale. Most “cash discount” programs are non-compliant, because they list the cash price on the shelf and then mark it up at the point of sale. When you add a fee to a listed price, you must comply with the card brand rules, and must not apply the fee to a debit card. 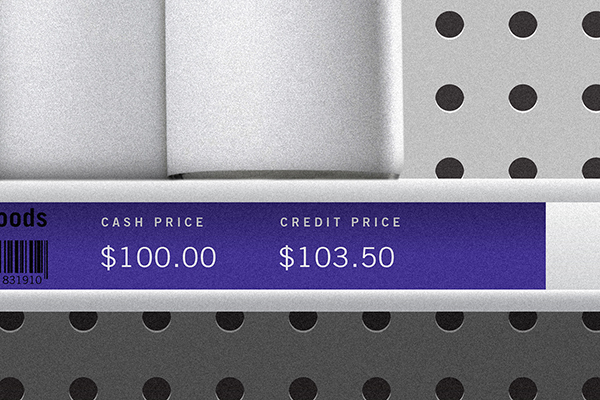 A compliant cash discount would show the “credit card price” alongside the “cash price” with equal prominence whenever prices are posted or quoted. See a compliant example. Almost all “cash discount” programs fail to meet these requirements, risking fines from the card brands and state attorneys general. Q: Can I pass on the cost of card acceptance with a “convenience fee”? No, you cannot pass on the cost of card acceptance with a convenience fee for several reasons. A convenience fee must be a flat-dollar amount, regardless of the value of payment due. In other words, the convenience fee must not be a percentage, and must not increase in any way as the transaction size increases. Furthermore, a convenience fee may only be applied in a card-absent channel of acceptance (such as online or by phone). In addition, the merchant must also accept credit cards in person and apply no fee to card-present payments; therefore, a merchant that accepts only card-absent payments may never use a convenience fee. Finally, a convenience fee may only be applied by the merchant, so a convenience fee applied by any third party is non-compliant. For these reasons, it is highly doubtful that a compliant convenience fee will cover the cost of card acceptance. Q: Can I pass on the credit card fee if a customer using a debit card presses the “credit button” on a terminal? No. Regardless of how the customer’s debit card is processed at the point of sale, you must not apply a fee to debit cards. To keep you compliant, CardX automatically detects when a debit card is entered and applies no fee. Q: Do different rules apply for government and education institutions? A: Yes, they are eligible for the “service fee” program. Government and education institutions are eligible for the “service fee” program, which permits the fee to be applied to both credit and debit cards. In addition, this program requires that the fee be processed as a second, separate transaction. To learn more, see our page for Government + Education. CardX is not just a payments company, but a recognized authority and a strong advocate for merchant affordability and consumer fairness. We were the only solution provider to file a brief in Expressions Hair Design v. Schneiderman, contributing real-world expertise to a landmark U.S. Supreme Court case. In March 2017, the Supreme Court held that state “no-surcharge” laws restrict constitutionally protected speech. This victory was celebrated by the merchants and their amici, including not only businesses such as Spirit Airlines, Kroger, Walgreens, and CardX, but also policy experts and think-tanks advocating for solutions that lower transaction costs, especially for low-income or under-banked Americans, who more often pay with cash and debit. This cause has united supporters across political lines, who emphasize that passing on the credit card fee is the best tool a merchant has for informing the customer of the transaction cost and giving the customer the incentive to reduce it. CardX is proud to offer the market’s leading solution.